Downers Grove is a fantastic town that has seen a lot of growth over the past several years. From the vibrant, evolving downtown to the quaint, neighborhood streets this town is one we love to have a project taking place in. And if you've followed us long enough, you know we always love when we can share our latest projects with all of you. If you live in Downers Grove, you may have seen the demo happening today on Stonewall Ave in the picturesque northwest corner of Downers Grove. Before we get to talking about the house, we have to talk about our amazing clients! This family already lived in the neighborhood and was ready for some more space and a home that was more relfective of their style. But they didn't want to leave the area they had come to love. After having three close neighbors and friends build with - and recommend - Oakley, they approached us to help them bring their dream home to life. Fortunately, they found a wonderful property a stone's throw from where they currently live and quickly set about planning their custom home with us. Also, as this family prepared for the demo of the home that originally sat on their new property, they turned to Habitat for Humanity's ReStore to ensure that any materials that could be salvaged, would be. How cool is that? There's always something special about a family that has a vision for their home from the start. This particular family wanted their home to pull inspiration from the welcoming look of timeless Craftsman style homes. 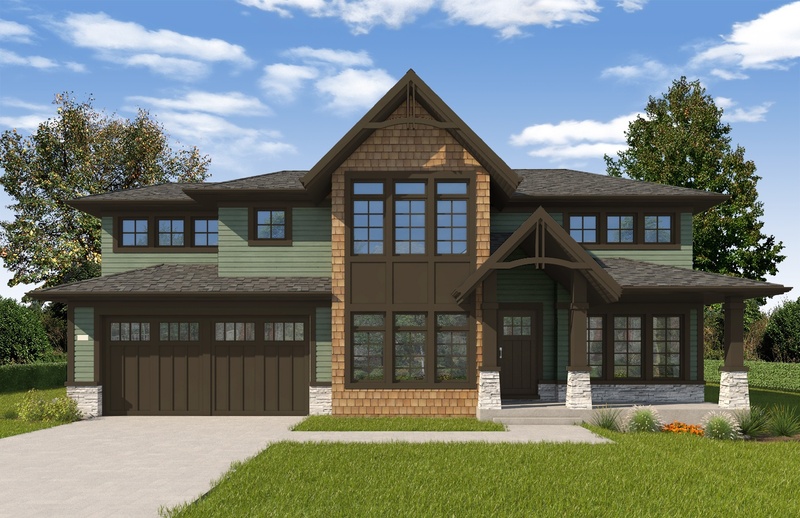 With exterior touches like cedar shake, a blue-stone, covered porch and stone accents, the natural materials really come together to deliver on that Craftsman style they love. As you move inside this home, the Craftsman-inspired touches continue with custom trim and carpentry details. It's clear this home's flow will work wonderfully for everday life as much as it will for entertaining. The family room and kitchen have distinct areas, but work together to feel open and airy. Double sets of french doors flanking the fireplace and a screened in porch off of the family room invite people to enjoy the outdoor living (including an outdoor fireplace - S'mores anyone?!) that this house offers as well. The kitchen features a large island that opens up to the family room, ideal for a weekday family breakfast or as a functional serving space for a holiday event. The homeowners included separate rooms such as a 1st floor study, walk-in pantry, butlers pantry and mud room which will allow them to stay organized and have designated spaces for everything. The second floor offers a special space for everyone. With a master bedroom suite complete with dramatic, vaulted tray ceiling, his-and-hers walk in closets and a spa-like master bath, this couple will surely enjoy their in-home retreat. Three additional bedrooms with walk-in closets, a jack and jill bath, a guest bath and a second-floor laundry room round out this functional floorplan. The location of this beautiful home only adds to it's charm and value. Minutes away from I-88 and 355 expressways, a quick walk to highly rated Pierce Downer Elementary, Herrick Middle School and Downers Grove North High School, and the shops, restaurants and a 28 minute (!!) express Metra train to Chicago all nearby mean this family can easily enjoy all that Downers Grove and the surrounding areas have offer. We cannot wait to get them into their home so they can begin doing just that! Are you looking to build your own Oakley dream home in Downers Grove or another area that we build in? Let us help play property matchmaker and help to find your ideal lot/location.